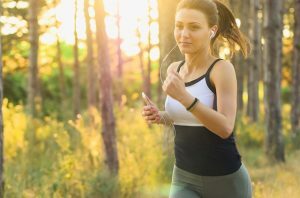 While wearing cotton while running won’t kill you or cause you any major bodily harm, you will be much more comfortable in clothing that is designed for sweating like a pig. Clothing is one of the areas where people often drop some major bucks in the running world. When starting out, you may want to buy a few running tops or sweat wicking t-shirts, some shorts/pants/capris to get started. One great place to shop for work out clothes isTJ Maxx! You will often find the same apparel that is in stores but for a cheaper price. Comfort is essential, $100 black workout capris are optional. Again, much like clothing, watches tend to be another place where runners drop mega bucks! For close to two years, I was perfectly fine running with a $5 watch from Wal-Mart. I currently run with the Gamin Forerunner 205 watch and could not be happier with it! I am not a “techy” person, so I was quite resistant to invest in what I thought would be an overly complicated device. The Garmin 205 is super user friendly! As fancy GPS watches are concerned, my watch is mid-level price wise but provides me with a lot of important information on my runs. I am able to tell my average pace per minute, my total time running, my distance, and approximately how many calories I’ve burned. If you are considering buying a running watch, you may find it much cheaper to shop online. I bought mine new for $117 on Amazon. When you finally finish that long awaited marathon, you jump to any photo occasion possible! I mean why wouldn’t you, you’ve been preparing for so long right?! But then you take a quick look in the mirror and realize that you don’t look so great after running a marathon. What do you do, well it’s too late to do anything honestly! What you can do for your next marathon is to have a permanent makeup service to help you look good, with out having to wear any actual makeup. Sounds like a great fix right?! Well make sure you take proper precautions. It probably wouldn’t be a great idea to get permanent makeup the day before your marathon!